Cut in quarters. Place wedges on tin foil. Sprinkle to taste: salt, pepper granulated garlic, place around 2 tablespoons and wrap tight. Do the same with the rest. Bake at 400 degrees for around 1 and 1/2 hours until browned and very soft. Hi this make me interest and would love to try this recipe...instead of shredding can I use a blender to make it more smooth? This is a tasty way to prepare cabbage and to get those non cabbage people to eat it! I have never seen any type of recipe like this-only from the kitchen imagination of Claudia! Well done, my friend! Not sure if my comment saved here. Your cat is adorable! 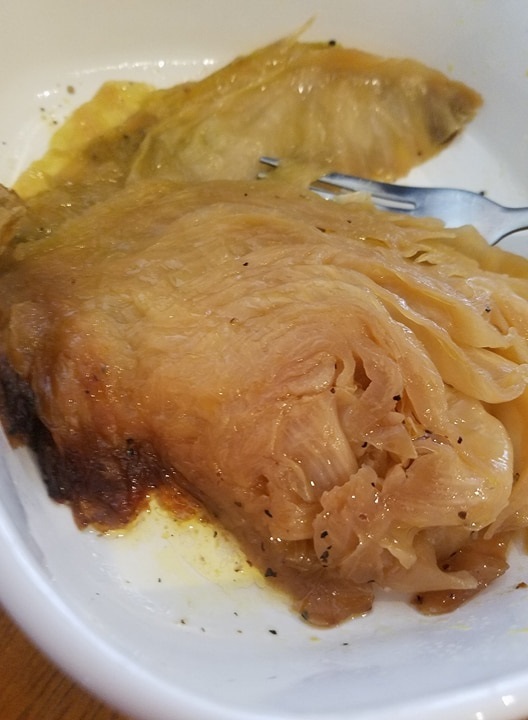 This is a great recipe for those who do not eat cabbage, for you have made it into a creamy side dish-which is not only tasty but unique. Never seen anything even close to this recipe-only from the creative mind of Claudia! Well done, my friend. Cabbage is so underrated - delicious! That photo is adorable. Aw, Fonzo is so sweet!!! And love the idea of a baked cabbage dish...yum! Cabbage is hard to make look pretty -- the paprika sure helped! -- but it sure is tasty! This cabbage dish is great comfort food. Such a pretty kitty! And a delicious casserole! Don't think I ever had baked cabbage before. Love the idea. I have come to appreciate the merits of cabbage in my middle-aged and this would be grand with some kielbasa. What is it about cats and boxes? I have more photos of Pip-in-a-box! So cute! Fonzo is just adorable! his dish sounds really tasty, I don't think I have ever had bakes cabbage before. What a delicious way to enjoy cabbage. Fonzo is the cutest! Fonzo is adorable! And this cabbage looks delicious! I have never thought about making it this way, thanks for sharing! Say hi to Fonzo. Just adorable. I made the cabbage and we loved it. I like to make new dishes with cabbage so thanks to you, I could do that. thought i would let you know i googled cabbage recipes and recognized the author of this post. i clicked through to say awesome that you are showing up on google.